HiRISE image ( PSP_001942_2310 ) shows a crater approximately 11 km (7 miles) in diameter, located in Acidalia Planitia, part of the Northern Plains. Several features in and around this crater are suggestive of fluids and ice at and near the surface. 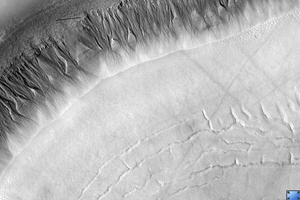 The south-looking (or equator facing) walls of this crater are cut by numerous gullies such as the ones shown in this image's cutout (500 x 600 m or 550 x 650 yards), with well developed alcoves, sinuous channels, and terminal fan deposits. 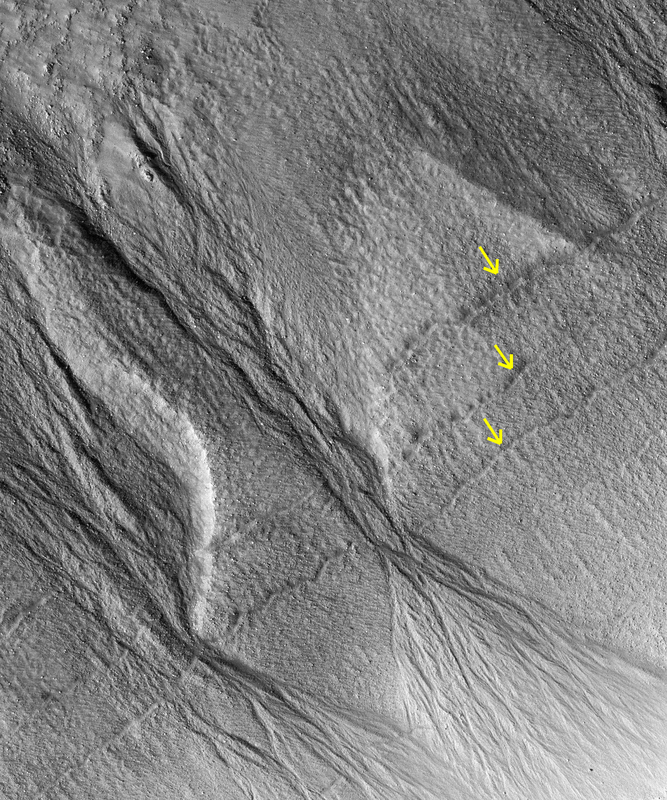 These gullies seem to originate at the same height, suggesting that the carving agent may have emanated from one single layer exposed in the crater's wall. Contrastingly, no gullies are observed in the north-looking (or pole facing) wall of this crater. Terrestrial gullies very similar to the ones shown in this image are produced by surface water. The arrows in the cutout show fissures that may indicate detachment of surficial materials possibly held together by subsurface ice, sliding en masse down the crater's wall. The muted topography of the crater and its surroundings, the relatively shallow floor (300 m or 330 yards), the convex slope of its walls-all are consistent with ice being present under the surface, mixed with rocks and soil. Ice would have acted as a lubricant, facilitating the flow of rocks and soils and hence smoothing landscape's features such as ridges and craters' rims. The concentric and radial fissures in the crater's floor may indicate decrease of volume due to loss of underground ice. Piles of rocks aligned along these fissures and arranged forming polygons are similar to features observed in terrestrial periglacial regions such as Antarctica. Antarctica's features are produced by repeated expansion and contraction of subsurface soil and ice, due to seasonal temperature oscillations. The funnel-shaped depressions visible in the crater's floor could be collapse pits, further evidence of ice decay; alternatively, they could be smoothed-out impact craters. NASA's Jet Propulsion Laboratory, a division of the California Institute of Technology in Pasadena, manages the Mars Reconnaissance Orbiter for NASA's Science Mission Directorate, Washington. Lockheed Martin Space Systems, Denver, is the prime contractor for the project and built the spacecraft. The High Resolution Imaging Science Experiment is operated by the University of Arizona, Tucson, and the instrument was built by Ball Aerospace and Technology Corp., Boulder, Colo.